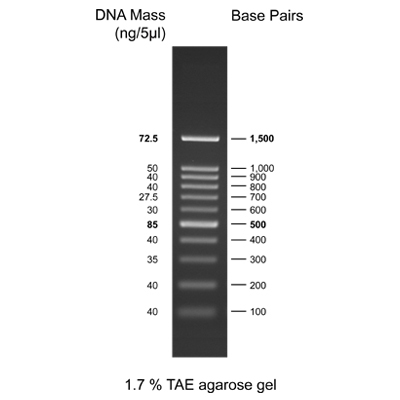 BLUelf Prestained Protein Ladder | GeneDireX, Inc. The BLUelf Prestained Protein Ladder is a three-color protein standard with 13 prestained proteins covering a wide range molecular weights from 3.5 to 245 kilodalton (kDa). 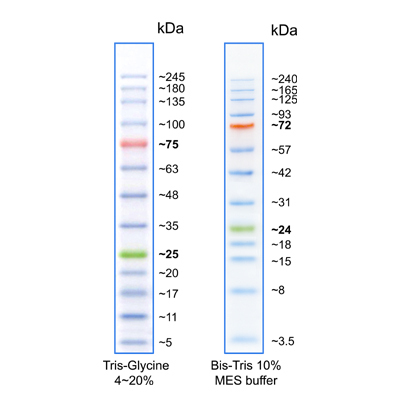 Proteins are covalently coupled with a blue chromophore except for two reference bands (one green and one red band at 25 kDa and 75 kDa respectively) when separated on SDS-polyacrylamide gel electrophoresis (SDS-P AGE) with Tris-glycine-SDS running buffer. The BLUelf Prestained Protein Ladder is designed for monitoring protein separation during SDS-PAGE, verification of Western transfer efficiency on membranes (PVDF, nylon, or nitrocellulose) and for approximating the size of p roteins. The ladder is supplied in gel loading buffer and is ready to use. Do not heats, dilute, and add reducing agent before loading. Monitoring of protein migration during SDS-PAGE. Monitoring of protein transfer onto membranes during Western blots. Sizing of proteins on SDS-PAGE and Western blots. Approximately 0.1~0.4 mg/ml of each protein in the buffer (20 mM Tris-phosphate, pH 7.5 at 25°C), 2 % SDS, 0.2 mM Dithiothreitol, 3.6 M Urea, and 15 % (v/v) Glycerol. The quality of the BLUelf Prestained Protein Ladder is tested on a lot-to-lot basis to ensure consistent product quality. Stable for up to 2 weeks at 25°C. Stable for up to 3 months at 4°C. For long term storage, store at -20°C. 1. Thaw the ladder either at room temperature or at 37-40°C for a few minutes to dissolve precipitated solids. Do not boil. 2. Mix thoroughly to ensure the solution is homogeneous.